Dr. Paul H. Lipkin, director of the Interactive Autism Network (IAN), addressed a federal committee on autism about two of IAN's health and safety research projects. At a July 26 meeting of the Interagency Autism Coordinating Committee, Dr. Lipkin outlined IAN research into preventing injuries in children with autism who wander, along with a mental health survey. 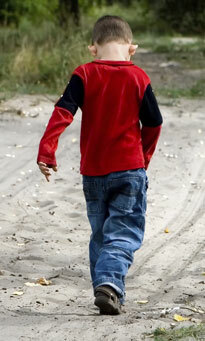 As IAN reported in 2012, almost half of children with autism have wandered or run away from caregivers and safe places. Called "elopement," this behavior can result in injuries, traffic accidents or drowning. More recently, more than 800 parents in the IAN Research registry answered questions about their children's wandering, the measures they used to respond to it, and the effectiveness of those measures. IAN surveyed parents in 2016. They rated window bars, fences, and enrollment in the Project Lifesaver program as being effective at relatively low cost. Project Lifesaver provides tracking devices that help first responders, such as police, locate people who have medical conditions that cause wandering. Families reported having limited access to home behavioral specialists and school aides, other potential measures to curtail wandering. Parents rated security cameras and GPS as having poor cost effectiveness. Families also rated various psychiatric medications as being ineffective in wandering prevention, as well as having a significant rate of side effects. They said service animals were effective but expensive or burdensome. Lori McIlwain, co-founder of National Autism Association, also reported on her organization's information on wandering in the United States. Of 808 people with autism who wandered and were reported missing from 2011 through 2016, 17 percent died and 13 percent needed medical attention, according to the National Autism Association. Dr. Lipkin also told the federal panel that IAN is researching mental health and suicidal behaviors among children and some adults with autism. IAN wants to better understand how common these problems are among children ages 8 to 17, as well as among adults who have a legal guardian. That study is still underway. Dr. Lipkin is a pediatrician specializing in neurodevelopmental disabilities at Kennedy Krieger Institute.